Director-General Motojima; Design Integration Section Leader Jean-Jacques Cordier; Head of Technical Integration Division Stefano Chiocchio and a few other guests were given a tour last week into the innards of the machine. In Fantastic Voyage, a 1966 science-fiction movie starring Raquel Welch and Donald Pleasence, a medical team and their submarine are miniaturized to the size of a human cell and injected into a scientist's body in order to operate a blood clot in his brain. The movie was a huge success, the voyage inside the human body spectacular, and a few scenes—like the attack by the blood's white cells—quite unforgettable. Although retaining their normal size, the visitors were able to virtually enter and explore the innards of the ITER Tokamak, walk through its walls and blanket modules, stand upon the divertor's surface, and observe the machine's every nut, bolt and weld. This was not science fiction. The virtual reality room that IRFM has just set up in its former library will be a precious tool for design and control activities, as well as a training platform for assembly and maintenance operations. This brand-new equipment is the work of CEA/IRFM who will use it for design and engineering activities, mainly in relation with Tore Supra, and also within the framework of collaborations established with ITER and, as part of the EU/Japan Broader Approach Agreement, with the Japanese Tokamak JT-60 SA. 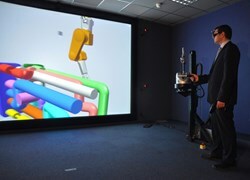 CEA/IRFM has added a capability to connect a physical robotic arm to the virtual objects that appear on the screen. The virtual reality room appears as a small and rather spartan 3D theatre—no velvet seats or sophisticated sound system. What makes it special, however, is the type of "movie" it features. 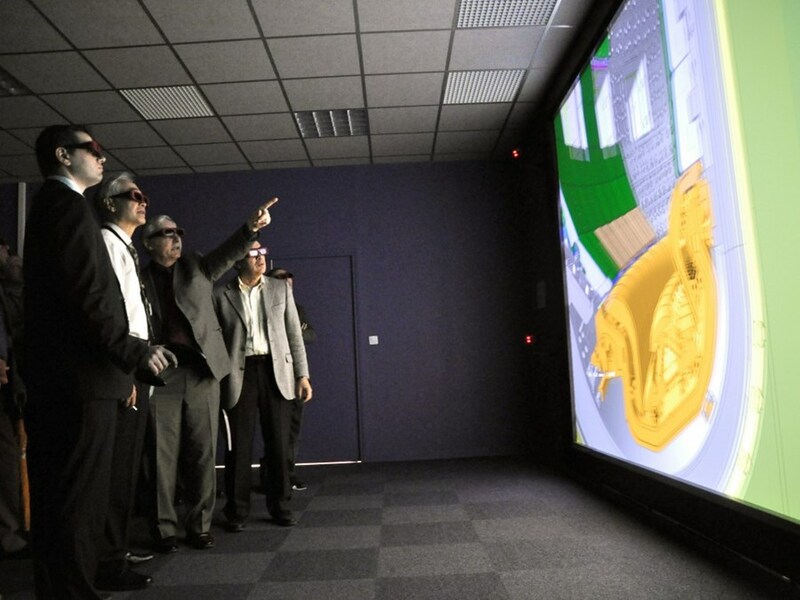 For the ITER machine, the 3D images that appear on screen are directly interfaced with the CAD files produced by the Design Office and Design Integration. Once equipped with 3D glasses, the viewer becomes virtually immersed in the image, whether it be a three-dimensional rendition of a machine component or that of a burning fusion plasma. Such techniques are not new. Virtual reality is widely used in the automobile and aerospace industries and in other fusion installations like JET or Laser Megajoule (LMJ). What has been added at CEA/IRFM is a capability to connect a physical robotic arm to the virtual objects that appear on the screen. The robotic arm is manoeuvrable by an operator, and can be programmed to mimic existing industrial counterparts. The operator can thus prepare and rehearse actual remote handling operations. The CEA/IRFM virtual reality room was financed by CEA through a recent French government "Recovery Plan" (Plan de relance) for research. Half a million euros were invested in the room's design and equipment.